My bedside table has had a bit of a makeover in the past month. It started when I replaced my old clock radio, which after about 10 years of faithful service was regularly wiping all the radio stations and more worryingly, the alarms 😱 So after a bit of googling, I went for this Phillips model from Argos which had good reviews and was only £19.99. 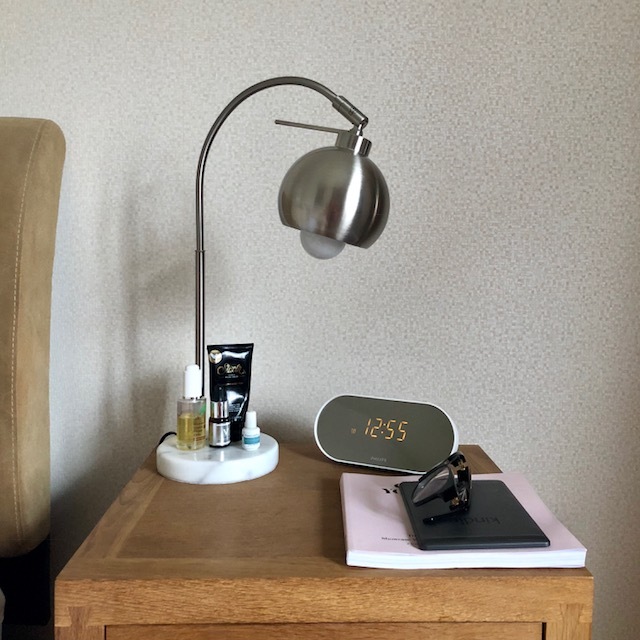 Then the usual problem of updating one thing, the lamp beside my funky new clock started to look a bit old fashioned so thanks to a voucher from M&S, I got the husband and myself some nice new bedside lamps in brushed stainless steel with a marble effect finish. As soon as I put the light and the clock together, it just worked...and the room suddenly had a cleaner more on-trend look to it. 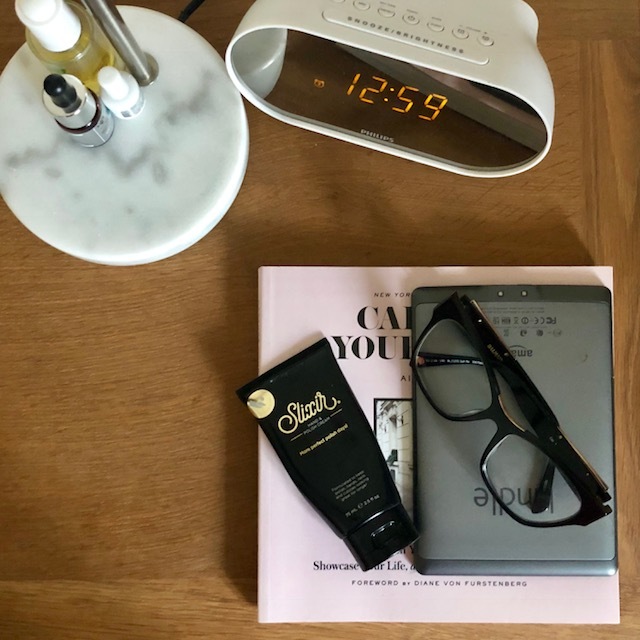 I finally had a bedside drawer unit worth photographing so I thought I'd do this blog post to tell you about the things that are always at my bedside - genuinely...I didn't curate this for the blog though I did tidy it up a bit. I've been using the CND Rescue RXX since I took off my last set of gel nails after the work trade fair in January. My poor nails were wrecked after 3 gels in a row and I decided to face up to a couple of months of no gels. The CND nail treatment has really helped as it's got keratin and is specifically made to treat post-gel nails. I got this tiny bottle on eBay for about £5. Well worth trying out - my nails have still struggled to grow longer but they're definitely stronger and healthier. 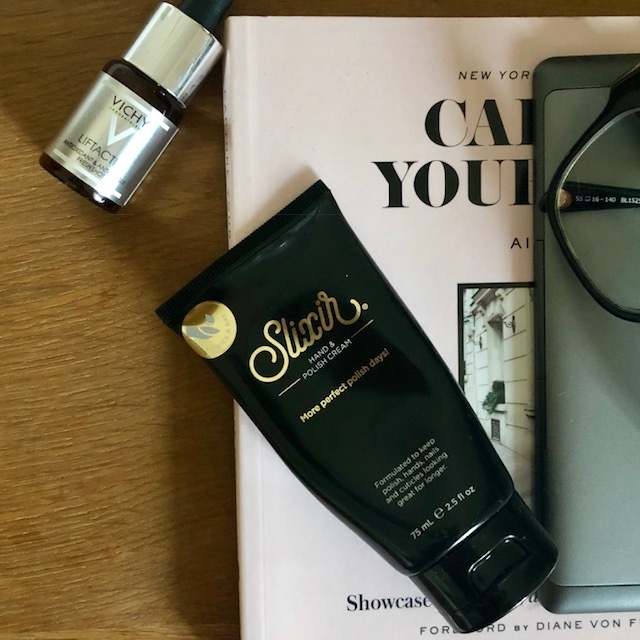 Around the same time, I was invited to road test SLIXIR® hand cream, a ground-breaking nail care hand cream formulated with a patent pending blend of natural vitamins and minerals. It's designed to care for and extend the wear of any nail varnish and features specially selected oils and plant extracts that work to protect nail coatings from the outside and restore suppleness inside. The texture is quite watery - so you have to work fast once you have it on your fingers. I also found that I needed a little more than the suggested 4 drops. Hence, I've been going through the bottle quite quickly but there's no doubt that it works. I'm genuinely impressed with how smooth my skin is after 2 weeks. So much so, that I've been rationing it but I will definitely repurchase this one as it's a great way to give your skin a boost. It's pricey at £28 - but on offer on Boots at the moment on the link above. Remember to wear a high SPF cream when using this serum. Finishing with my daily skin essential - rose facial oil. 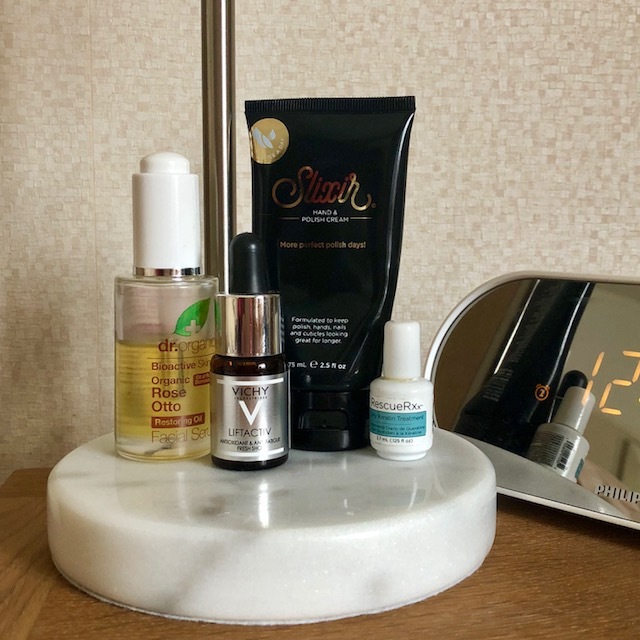 I usually use Neal's Yard Facial Oil but the finances were tight after Christmas so I picked up some less expensive rose oil serum in Holland & Barrett. It's the Dr Organics range which I'll be honest, I've found to be somewhat disappointing in the past. This Rose Otto Facial Serum oil is ok though - it's nowhere near as nice as Neal's Yard but it's half the price and is doing the job for now. It would make a good inexpensive option if you wanted to try a facial oil for the first time. After all, if it doesn't work out for you on your face, you can use it on your hands/nails/elbows - it won't go to waste. Incidentally, the Trilogy Oil on this link is gorgeous too. 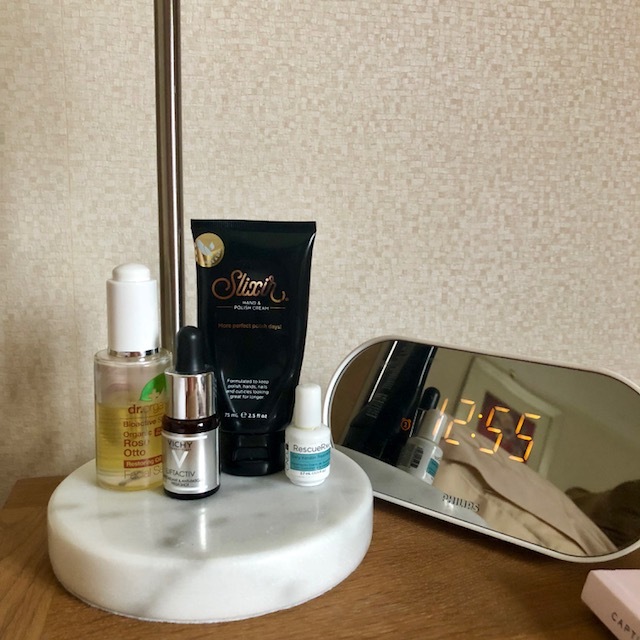 Disclosure - the Slixir hand cream and the Vichy serum are PR samples and the bedside lamp was bought with a gifted voucher from M&S. Everything else was purchased by me. Some of my links are affiliate links which means the website knows you clicked through from my blog and may pay me a small commission if you buy and keep the item. This tiny income stream goes towards the costs of maintaining my website/URL.